Women clad in aprons have traditionally prepared the Thanksgiving meal, and it is within our historical linkage to share our bounty. Over the years, I’d noticed Thanksgiving talked about in terms more commonly associated with stress than joy. 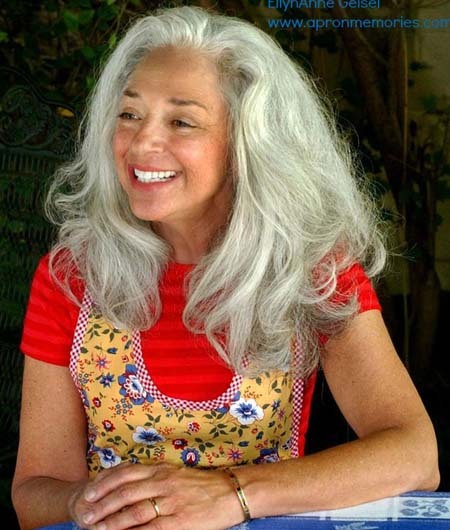 Remembering my mother’s absolute love of Thanksgiving as a day more than anything else of sharing and gratefulness, I embarked on a personal campaign to put the “give” back into Thanksgiving. So seven years ago, on the day before Thanksgiving, I wrapped a pie within an apron and wrote a sympathy note; then I tied on a pretty apron and with bundle in hand, walked out the door to a neighbor’s home where a deep sadness dwelled. Awaiting an answer to the doorbell, I was slightly uncomfortable for the tardiness of my recognition of her circumstances and considered leaving my offering on the porch and bolting. I’m forever happy that I didn’t drop and run because the expression on my neighbor’s face was not one of recrimination; rather, she looked totally stunned. Here, I said, gesturing she should take the apron-wrapped pie, I just want you to know that we’ve been thinking of you and your family. And with that, I stepped back and off the porch. Unable to resist, I turned and there she was, still in the doorway, holding the pie and smiling. And then she waved. My heart leapt. I was unprepared for the joyfulness I felt from sharing a piece of our Thanksgiving bounty with someone in need of sustenance – physical, spiritual or emotional – a kind word or just the recognition of not being invisible. That such a small gesture provided such a win-win to me and my neighbor seemed extraordinarily simplistic, yet the sentiment of Thanksgiving is exactly that. Such a notion, I decided, begged to be shared. 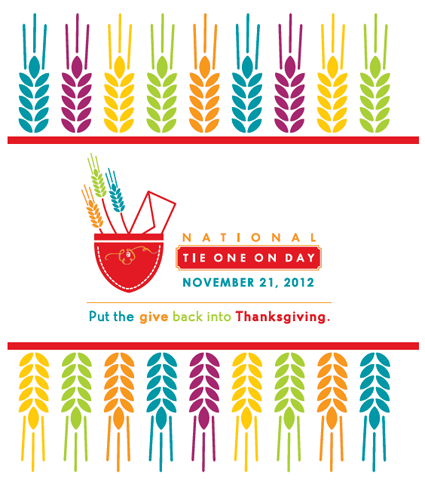 Creating National Tie One On Day™ through Chase’s Calendar of Events was a first step to recruiting others to put the “give” back into Thanksgiving by sharing their good fortune with someone in need of a kind gesture. Always a sucker for the FGWP (free gift with purchase) promotions, a goodie giveaway debuted as well, providing participants a chance to win aprons from my collection or copies of my first books, courtesy of NTOODay’s first sponsor, Andrews McMeel publishing. 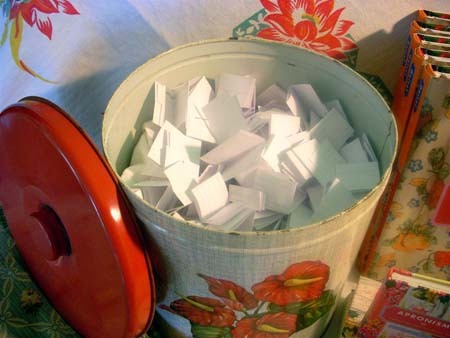 With each posting on that first NTOODay Goodie Giveaway blog, I wrote out an entry, and on the eve of Thanksgiving, my husband closed his eyes and, from a vintage canister, selected the giveaway winners. From that first blog posting to today’s, the heart of National Tie One On Day™ is the participants, because the more who take part in putting the “give” back into Thanksgiving, the more who benefit. What’s evolved over the years is the expansion of sponsor listings and giveaway goodies. BERNINA’s support of National Tie One On Day™ has brought NTOOD to a new level of national recognition, which translates to participants and entries into the Goodie Giveaway filling-to-overflowing that first canister and many, many more! 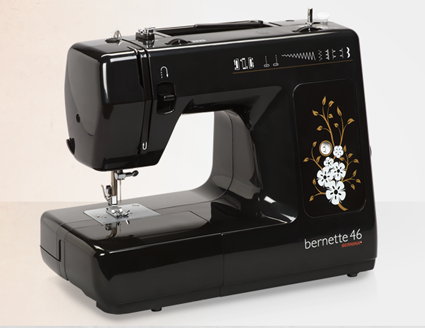 BERNINA continues to demonstrate that it is a company of such heart and spirit of sharing with a goodie giveaway to take your breath away: the bernette 46. One very, very lucky winner of the Bernette 46 will be selected November 21, the eve of this year’s Thanksgiving. Entry is a click away (on the homepage of my website http://www.apronmemories.com/). Packaging can also set some into a tailspin – the idea of perfection is not compatible with National Tie One On Day! Wrappings easily accomplished include a brown bag tied with ribbon to a covering with vintage (or new) toweling. For those of us who dwell, I share my last year’s delivery packaging: mini-loaves wrapped twice…first in a vintage hankie, then a hotpad secured with ribbon. My apron choice was sewn of reproduction dishtoweling – the striped ties are pictured to the far left of the lunch pail. Whether home sewn or purchased, an apron adds a festive touch to your NTOOD delivery and holiday setting. 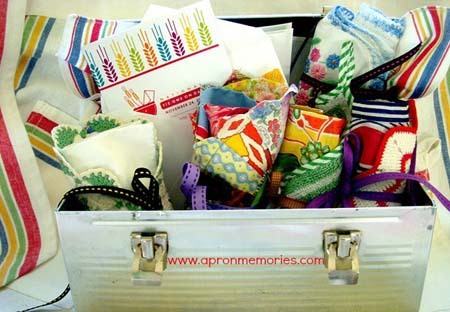 Thank you for joining BERNINA in putting the “give” back into Thanksgiving by participating in National Tie One On Day™ and sharing your plans and experience on http://www.apronmemories.com/. Remember: the more who participate, the more who receive.